The G-POWER HURRICANE is available as a fully converted car starting at 240,000 Euros. 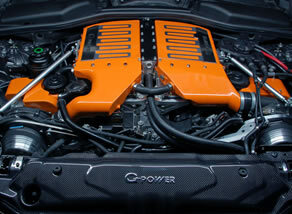 To achieve the desired increase in power output of 223 hp / 164 kW for the fast-revving engine that normally produces 507 hp / 373 kW, G-POWER, in cooperation with ASA Automotive, has developed a high-tech supercharging system. The system uses one belt-driven ASA T1-12 compressor for each cylinder bank. Contrary to conventional mechanical chargers that waste a large portion of the additional power on being driven themselves, the ASA compressor has an efficiency rate of up to 80%. Acceleration performance benefits accordingly. With a sprint time from rest to 100 km/h of 4.2 sec the two-ton sedan bests its production counterpart by half a second. With approx. 10 sec to 200 km/h the advantage grows to 5.0 sec. 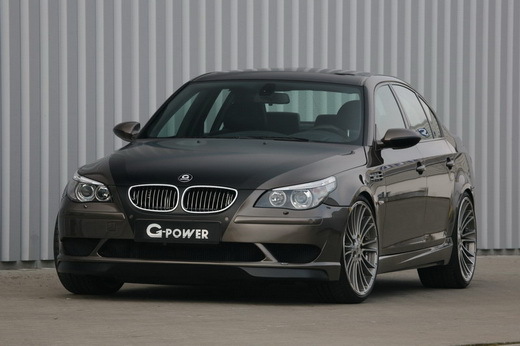 Nice BMW from G-Power, very relevant to what I was searching for (compare car insurance rate).